The Town of Barnstable includes seven villages (Cotuit, Marstons Mills, West Barnstable, Barnstable, Centerville and Hyannis) within its boundaries. Each village has unique and significant cultural and historical qualities. Barnstable takes its name from Barnstaple, Devon, England. The area was first explored by Bartholomew Gosnold in 1602. Barnstable was one of the first towns to be settled, one year behind Sandwich, in 1638, and was incorporated in 1639. The early settlers were farmers, led by the Reverend Joseph Hull, the founder of Barnstable. A memorial tablet was dedicated there in 1939 (the 300th anniversary of the town's founding) marking the site of his home, and the rock from which he preached still stands along the highway there. Today, tourists come in droves to the town during the summer months. There is abundant shopping in the quaint shops of Hyannis, and other popular sites abound, such as the John F. Kennedy Museum and several other museums and places on the National Register of Historic Places, including the Ancient Burying Ground and Gideon Hawley House. Barnstable has a working harbor, several small beaches and is a popular spot for residents and visitors alike. Over a decade ago, Peter Scalata and William “Billy” Achorn were sitting around their living room with friends, enjoying a great cup of coffee. The conversation meandered comfortably for a while, but ultimately led to a specific question: How and where might they recreate the experience of warmth and lively conversation for a larger community? In 2004, this question was answered. 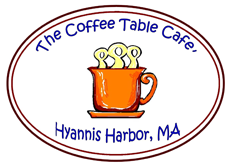 The Coffee Table Cafe opened at the Popponessett “Poppy” Marketplace in Mashpee, Massachusetts. Then in 2008, in response to their many devoted customers on the Cape, they added a new site at the Hy-Line Landing in Hyannis.Peter and Billy will continue to welcome you to stop by at any time. If you choose to indulge in their uniquely roasted coffee and delectable pastries and deli sandwiches, you will most certainly share a carafe of good humor. A happy respite from the daily grind! The pair’s vision of coffee with friends has certainly expanded from their living room, with much larger tables and in two locations! Cheers from Peter and Billy! Enjoy your vacation, or just another cup of coffee! Deck: Showers may persist most of the week?Towns: BarnstableBourneBrewsterCentervilleChathamCotuitDennisEasthamFalmouthHarwichHyannisMarstons MillsMartha's VineyardMashpeeNantucketOrleansOstervillePlymouthProvincetownSandwichTruroWarehamWellfleetWoods HoleYarmouthTopic: NewsAuthor: CapeCodToday StaffTeaser: Showers may persist most of the week?Main Image: Thumbnail Image: Image Gallery: Body: From the National Weather Service: Scattered? Deck: Works starts May 6thTowns: BarnstableHyannisTopic: Town NewsAuthor: CapeCodToday StaffTeaser: Work starts May 6th?Main Image: Thumbnail Image: Body: HYANNIS, MA - The Town of Barnstable Department of Public Works? Water Supply Division will be finalizing a water works construction project that improved the water quality and fire flows for customers of the Hyannis Water System in the Main Street area. This project cleaned and lined approximately? BARNSTABLE ? From Barnstable County Sheriff?s Office: A five-man crew of inmates dispatched by Barnstable County Sheriff James Cummings has the Coast Guard Heritage Museum in Barnstable Village in ship shape, and not a moment too soon. Its May 1st seasonal opening is just around the corner. Hours are 10 AM ? 3 PM, Tuesday [?] The post Inmates prepare Coast Guard museum for annual spring opening appeared first on CapeCod.com. Deck: In honor of PFC Zacharay Arsenault, USATowns: BarnstableBourneBrewsterCentervilleChathamCotuitDennisEasthamFalmouthHarwichHyannisMarstons MillsMartha's VineyardMashpeeNantucketOrleansOstervillePlymouthProvincetownSandwichTruroWarehamWellfleetWoods HoleYarmouthTopic: NewsAuthor: CapeCodToday StaffTeaser: In honor of PFC Zacharay Arsenault, USAMain Image: Thumbnail Image: Body: From the office of Governor Charlie Baker: Please be advised that? Grant aids enforcement as bill on hands-free devices awaits action. Deck: "Strike fund" will be used to help S&S strikers facing financial hardship?Towns: BarnstableBourneBrewsterCentervilleChathamCotuitDennisEasthamFalmouthHarwichHyannisMarstons MillsMartha's VineyardMashpeeNantucketOrleansOstervillePlymouthProvincetownSandwichTruroWarehamWellfleetWoods HoleYarmouthTopic: BusinessHub Category: BusinessAuthor: CapeCodToday StaffTeaser: "Strike fund" will be used to help S&S strikers facing? Deck: Saved museum $2,400 in labor costs?Towns: BarnstableTopic: Police and Fire NewsHub Category: Police and FireAuthor: CapeCodToday StaffTeaser: Saved museum $2,400 in labor costs?Main Image: Main Image Credit: An inmate work crew readies the signs at Barnstable's Coast Guard Heritage Museum. (Courtesy of Sheriff Cummings)Thumbnail Image: Body: From the office of Barnstable County James Cummings: A five-man crew of inmates? Deck: If you wrap your boat you should read this?Towns: BarnstableBourneBrewsterCentervilleChathamCotuitDennisEasthamFalmouthHarwichHyannisMarstons MillsMartha's VineyardMashpeeNantucketOrleansOstervillePlymouthProvincetownSandwichTruroWarehamWellfleetWoods HoleYarmouthTopic: BusinessHub Category: BusinessAuthor: CapeCodToday StaffTeaser: If you wrap your boat you should read this?Main Image: Main Image Credit: (Courtesy photo)Thumbnail?